I/O Extended is over, but at MapsPeople we still feel the magic from one of the highest-attended Extended events in the world. For the sixth year running, MapsPeople co-hosted I/O Extended with the Danish ICT cluster, BrainsBusiness, and Google Developers Group (GDG) Aalborg. With 370 participants, Google I/O Extended Aalborg was not only the biggest event in Europe for the second year in a row, it was also one of the biggest events worldwide. As always, the day was kicked off with an exclusive codelab for skilled developers. This year’s codelab was led by Google Developer Expert, Vadim Markovtsev. Markovtsev, a machine learning expert, guided the forty participating developers through three hours of deep recurrent neural network. In other - and far more digestible words - the codelab was an introduction to machine learning with focus on image recognition. The event was held at Game Streetmekka Aalborg, which is part of the Danish street sport NGO, Game. 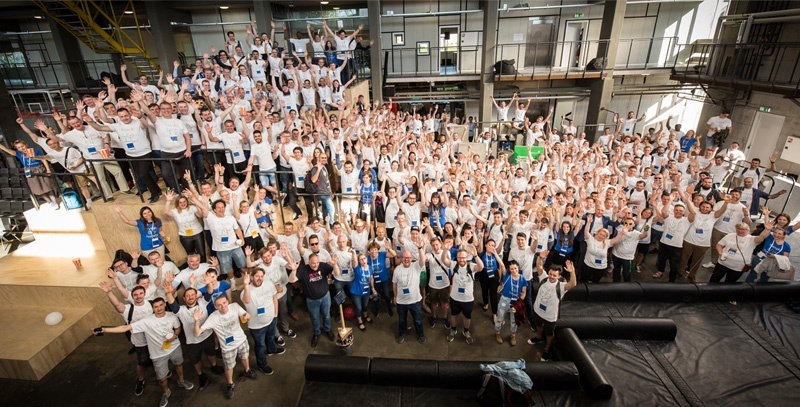 The former industrial site provided the perfect settings for a full-blown Aalborg event with local sponsors from Samsung, Telenor, Trackunit, Green.click, Combine and GDG. Attendees also got the chance to grapple with virtual reality drawing with Aalborg-based GameScope providing their VR equipment. Uffe Wedsgaard Koch from Det Gode Firma also participated in the event with the prototype of the service robot, Kugle, a collaboration between Det Gode Firma, Combine, the Automation and Control section at Aalborg University, the Technological Institute and MapsPeople. As always, The Google Keynote was crammed with exciting news and sneak peeks of upcoming features. Here are some of our favorites. It may have been the highlight of the keynote when Google CEO Sundar Pichai gave an amazing demo of Google Assistant calling a hair salon. Without the slightest hint of a computer-generated voice, Google Assistant was able to lead a conversation as you or I would and book a hair appointment - the salon employee didn’t even seem to recognize that she was talking to an AI bot. As Google Maps enthusiasts we were also quite excited about the AR directions. By pairing AI with Street View data, Google now makes it possible for you to simply point your phone’s camera in a direction and see an interactive, AR turn-by-turn experience. The feature even includes an animated character that guides you from A to B.
Google Maps is also getting more social with the new tab, “For You”, that features recommendations tailored to you. It lets you follow specific neighborhoods to see e.g. new restaurants that are trending, and you can even coordinate with your friends in real time when deciding where to eat. Do you know how much time you actually spend on your phone, which apps you use the most, how many notifications you receive on a daily basis or how many times you unlock your phone each day? With the new Android P, you can monitor you digital wellbeing, and even set time limits on individual apps if you want to cut back on staring at your phone. In the future, Google Assistant users will be able to choose from six different, natural sounding voices when using the assistant. If you're a John Legend fan, you can look forward to later this year when Legend’s voice is also added to the selection. Google’s expanding the Smart Reply feature to “Smart Compose”. Smart Compose uses AI to help you to quickly write email from scratch. In other words, the feature makes suggestions for complete sentences as you type and you just have to hit “Enter” to keep the suggestion. What’s a mobile without a proper camera? Now, Google’s adding new features to Google Photos, so your editing becomes even better. With the new features, you can separate subjects from the background, pop colors, or turn the background black and white. Additionally, you can colorize your black and white photos - even if they weren’t shot in color to begin with. Photos will also analyze your pictures and recommend quick fixes to make them better. The editorial focus of the Google News app is now mainly powered by AI. This allows the app to analyze all content published to the web, organize it into storylines, and spot the news you may find interesting. The selected news will be put into your briefing, but the app will also include other stories to bring you a bit outside your bubble. As you can see, AI was the main theme in this year’s Google keynote, but even though we have come a long way with artificial intelligence, there can be no doubt that what we’re seeing now, is just the tip of the iceberg.